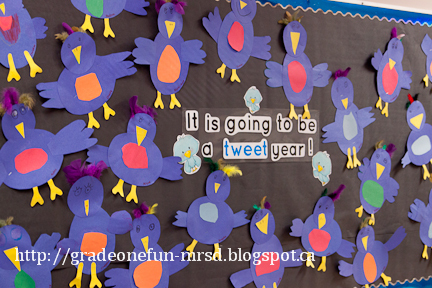 For our back to school bulletin board this year, I decided to go with a bird theme. I came up with the title of "It's going to be a "tweet" year." Each child made their own bird to decorate the board. I love how each bird is unique, and equally adorable! 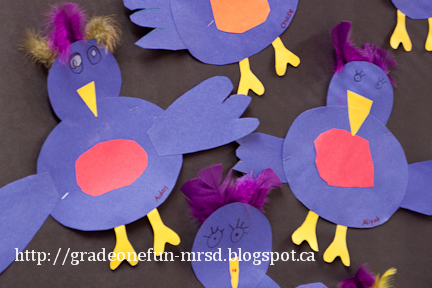 Once the children were finished drawing, cutting, and gluing their bird together, I surprised them by saying that they could each choose some feathers to put on the head. They were really excited about that! I like to take any opportunity I can to make something into an event. By not telling them at the beginning that there would be feathers, it really hyped them up (in a good way!) at the end.